Hi! Today is my birthday! I had a wonderful day. My girls wanted to take me out for dinner, so we went to Applebees and went to Sweet Frog for dessert. I guess my diet went out the window today. Haha! I have some squares here to mail out. I've just been a bit of a bum lately. My medication has exacerbated my depression and anxiety. It makes it hard for me to do anything. I think of you all. I got another puffy! Yay! I was feeling so bummed today and this package brightened my day. Thank you, cshort! I got a puffy today! Yay! It's from Katy ???? Sorry I'm gone so much. I've been struggling with some health issues and taking care of my girls and home are taking up all my available energy. I do think of you ladies often. I hope all is well. I better get going. Dinner isn't going to cook itself, unfortunately. Haha! Nothing really exciting during our snow storm. My oldest didn't have school on Fri because of it. ONE inch of snow! Haha! It's so funny to see everyone freak out over snow here. We did end up with 2 inches on Sat and the roads were a bit swishy to drive on. Again, EVERYTHING closed! Owlvamp--are you only able to check in on here when you are on the network, not wifi? Somehow, my IP address got blocked and I can't access this site from my iPad or my laptop. I can only access from my phone when it's not connected to my wifi at home. I'm here! I haven't been able to log on since the New Year. It was so strange. My Internet went all weird and then I couldn't access this site AT ALL ever since. 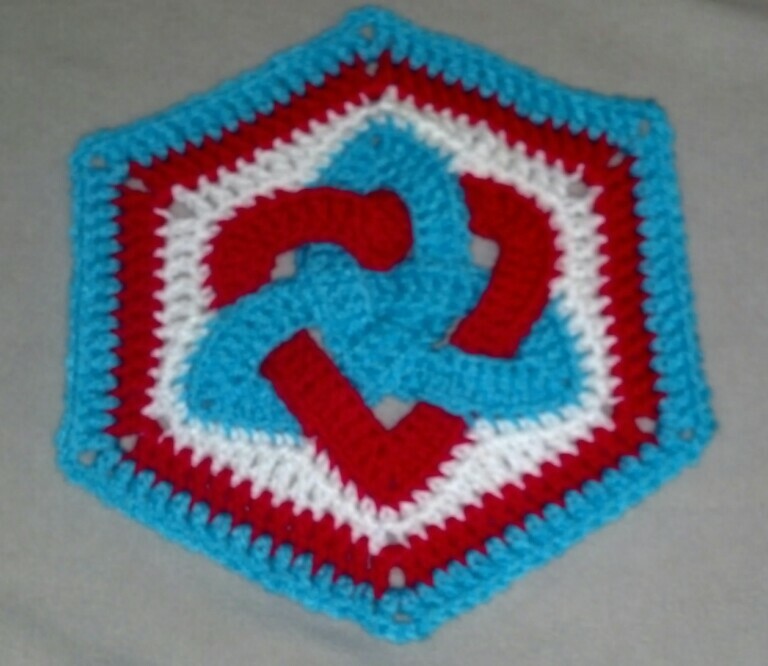 I finally figured out a way to contact someone from Crochetville and now Amy Shelton is helping me out. It looks like my IP address was accidently blocked! All this time, all I had to do was log in while on the network, not on my wifi at home. Ugh! So, here I am, eating up my data for you ladies We are all okay. It looks like the baby and I have suddenly become lactose intolerant. I can't even have chocolate! Waaaah! My husband is putting in for a supervisor position. That would mean a $10k a year pay increase, at least. Woot! The weather here is crazy. 60 deg one day, snowing the next. It's currently raining/sleeting/snowing, all at once. Gotta go. I'll look at who is getting squares this month and get hooking. Yay! I can't wait! Our black hole has swallowed up a watch, mancala bead (lost in the same location as the above watch), electronic key fob, iPod (though it showed back up a year later in a spot we searched FOUR times! ), and my favorite tapestry needle (a long metal one) These are things that went missing with no explanation. They're last known location was explicitly known and wasn't messed with. Extensive searching, and even moving from the house, didn't turn them up. I did find my tank top though. It was under my bathroom sink. ??? All I can think is that the baby put it there. Toddlers. I have several graphgan patterns that I want to make, but I've been too nervous to give it a try. I don't know anyone,in person, that is a more advanced crocheter than I, to walk me through it. Pineknott, do you know how to make a graphgan? Thank you for sharing your project! Nice idea. That is a truly amazing square! I just read through the directions and my mind is blown. I posted the patterns for my tiny snowflakes! I'm so bummed. I lost my favorite tank top (yes, its warm enough for that! Ha!). I've looked EVERYWHERE for it, including places that don't make sense. We have a black hole that follows us around. I'm guessing it's claimed another victim.